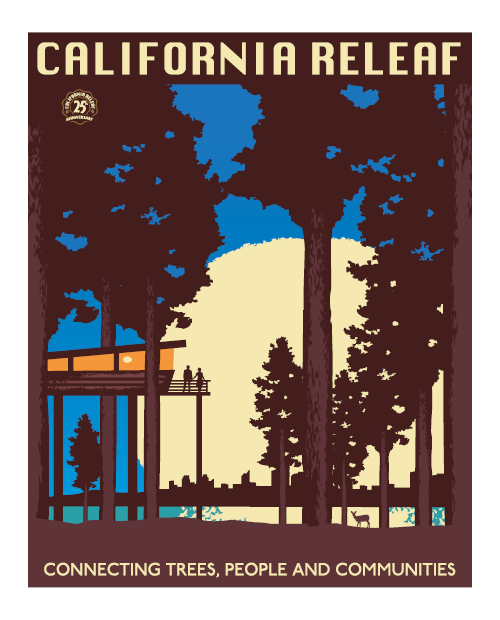 In 1989, California ReLeaf started the important work of empowering grassroots efforts and building strategic partnerships that preserve, protect, and enhance California’s urban and community forests. We hope that now, 25 years later, you’ll help us celebrate our success! 1989 was a year of great historical significance. The Berlin Wall fell. Students stood in protest in China’s Tiananmen Square. The Loma Prieta earthquake shook the San Francisco Bay Area. The Exxon Valdez spilled 240,000 barrels of crude oil along the Alaskan shoreline. The world was abuzz with change and concern. That year, long-time urban forestry and parks advocate Isabel Wade saw an opportunity for change within California’s communities. She brought the idea for a statewide urban forestry program called California ReLeaf to the Trust for Public Land (TPL), a national land-conservation organization. While small in comparison to most memorable events of 1989, Wade’s idea has gone on to make a big difference for urban forestry efforts in California. Over the years, many people have made California ReLeaf a success. To celebrate our anniversary, we’ve interviewed some of those who have made the greatest impact on the organization. In October 2014, California ReLeaf hosted a 25th Anniversary Reunion Party to celebrate and share all the hard work and good memories that have made the ReLeaf Network the wonderful, active community it is today. April 29, 1989 – Arbor Day California ReLeaf is born – launched as a program of The Trust for Public Land. Selected by the State of California to serve as the State’s Volunteer & Partnership Coordinator for Urban Forestry. California ReLeaf Network created with 11 members. Genni Cross becomes Executive Director. 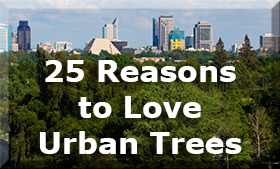 Supports 53 urban forestry projects with America the Beautiful Act funding ($253,000). First Statewide Meeting of the ReLeaf Network is held in Mill Valley – 32 Network groups attending. 204 tree-planting projects plant over 13,300 trees. ReLeaf Network grows to 63 organizations. Governor Gray Davis signs the Safe Neighborhood Parks, Clean Water, Clean Air and Coastal Protection Bond Act (Prop 12), which included $10 million for tree planting projects. Martha Ozonoff becomes Executive Director. California voters approve the Safe Neighborhood Parks, Clean Water, Clean Air and Coastal Protection Bond Act. Advocates for the restoration of $10 million in urban forestry funding in AB 1602 (Keeley), which will be signed by Governor Davis and become Proposition 40. Co-hosts the California Urban Forest Conference in Visalia with the California Urban Forests Council. Leaves the Trust for Public Land and becomes an affiliate of the National Tree Trust. Incorporates as a 501(c) (3) nonprofit organization. California voters pass Proposition 84 – contains $20 million for urban forestry. Sponsors AB 2045 (De La Torre) to update the 1978 Urban Forestry Act. Co-hosts the Community Tree Leadership Forum with the Alliance for Community Trees in Santa Cruz and Pomona. Administers $6 million in American Recovery and Reinvestment Act (ARRA) funding. Joe Liszewski becomes Executive Director. California Arbor Week is established under Assembly Concurrent Resolution ACR 10 (Dickinson). Awarded $150,000 for environmental education sub-grants from the Environmental Protection Agency – the sole recipient for the Region IX. Ensures non-profits are eligible recipients for all cap-and-trade funds in AB 1532 (Perez). Leads a coalition of land trusts in protecting and revising the EEMP. Secures $17.8 million in cap-and-trade auction revenues for CAL FIRE’s Urban and Community Forestry Program in the 2014-15 State Budget. ReLeaf Network grows to 91 organizations. To celebrate our 25th anniversary, California ReLeaf celebrated its milestone year by organizing a California ReLeaf Tree Team to participate in the California International Marathon (CIM). Congrats to our runners! California ReLeaf has supported hundreds of non-governmental organizations and local municipalities in more than 820 projects that have planted and cared for nearly 200,000 trees, engaged thousands of volunteers, and leveraged more than $9 million in matching funds.